As she woke up in the pod, she remembered three things. First, she was traveling through open space. Second, she was about to start a new job, one she could not screw up. Third, she had bribed a government official into giving her a new identity file. None of this information was new, but it wasn’t pleasant to wake up to. A young woman, Rosemary, flees a difficult situation on Mars in the most boring way - she accepts a entry-level bookkeeping job aboard the Wayfarer, an independent ship that builds hyperspace tunnels. She joins the motley collection of humans and aliens of various denominations as they embark on a particularly long mission through deep space to a remote but politically important planet near the galactic core. The Long Way to a Small, Angry Planet had an unusual gestation, starting out as a self-published kickstarted The kickstarter page. It raised the grand sum of $2810 novel. Every other self-published work I have come in contact to has been awful but I can happily report that Small, Angry Planet is quite good, at least along certain axes. Chambers has a real talent for larger than life characters, each member of the crew has a distinct voice and is vividly rendered. Likewise, the little sci-fi details of the universal the characters inhabit is as good as anything I have read, from the technology that powers the ship right down to the galactic politics that kicks off the mission. The author was nominated for the British Fantasy Awards' 2016 Best Newcomer. It is also pretty clear why it didn't win any. With great characters, interesting setting and exciting premise, the novel seems incapable of producing an engaging plot with tension and intrigue. The structure is episodic - nothing wrong with that - but each time a difficulty is encountered it is defused quickly in the most mundane way possible. Space pirates? A quick bribe. Rosemary's dark secret revealed? Nobody cares about it. The crew might be eaten by giant space crickets? Better close the door then. Even the final climax is quickly set up and overcome in a couple of pages. 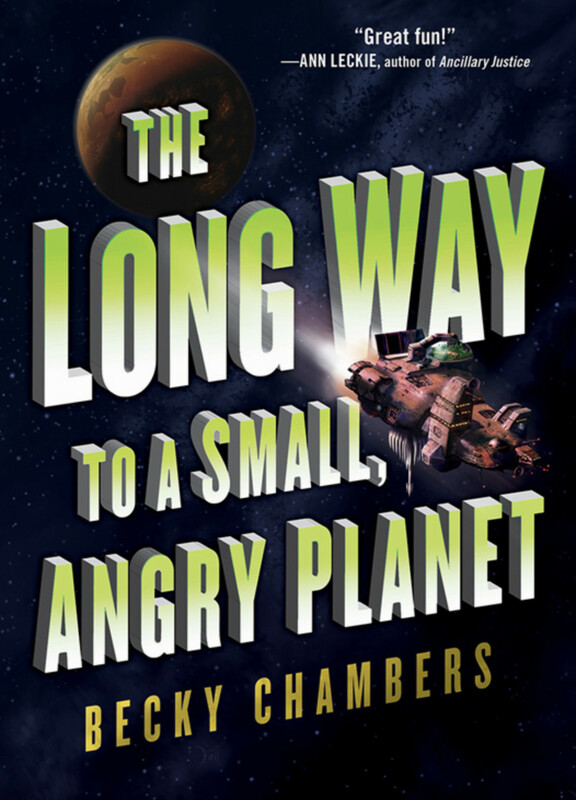 Small, Angry Planet is the written equivalent of comfort food. Not boring but unexciting, not trite but comfortable. What saves the novel is the breezy writing and excess of charm. I am not recommending that you dash out and read The Long Way To A Small Angry Planet but you could do worse.